One of the reasons you would install a small grinder pump in your home is you want to install a full bathroom in your basement. The main sewer line is going through you foundation in the basement up high requiring you to install the grinder pump. The purpose of the grinder pump is to pump the sewage up, and into the main sewer line. So it can drain properly. We would first find the perfect location to install the grinder pump tank recessed into the ground in your basement. Then we would find the best plumbing location in your main sewer line, and run the line from the grinder pump to your main sewer line. We then will have to find the vent line if you have a future vent line in your basement that’s great, if not we will run one to your attic vent line. Then your fixtures can be ran to the injector tank. 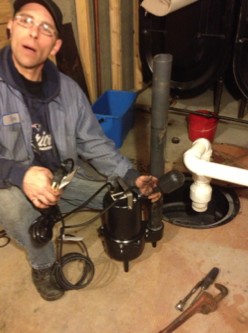 If you are installing a bathroom in your basement call us at United Sewer & Drain to help solve your grinder pump issues. All our grinder pump installations come with our warranty.